Gold Mountain Beauty offers a natural alternative for your entire family to promote healthy teeth and gums without toxic ingredients. Contains no synthetic additives, preservatives, fluoride, artificial colors or flavors, and no foaming agents or abrasive salts. Uniquely formulated to clean and safely polish teeth, improve gum health and freshen breath. Get a dentist cleaning feeling at home. This safe all natural formula is proven gradually removes stains from coffee, wine, etc., to reveal whiter, brighter teeth! Use once or twice per day, for at least 30 days to see results! This product does NOT bleach teeth with chemicals, so results take place over consistent usage and focuses on removing existing stains. Improves yellowed or discolored teeth naturally to regain a confident smile. 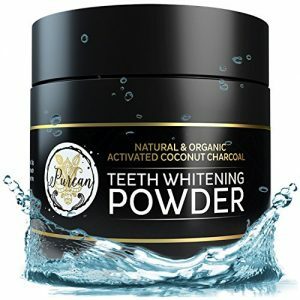 This product is great for natural teeth whitening for sensitive teeth. Many people see their teeth whiten by 2-3 shades. 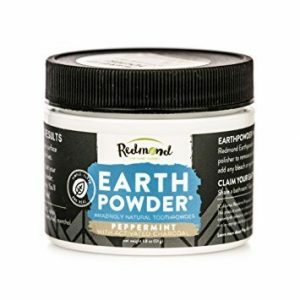 This product is a very fine black powder. Be cautious when opening the jar, and during use. The powder can be messy if you’re not careful, but is easily wiped up. If you experience any increased tooth sensitivity or irritated gums, discontinue use immediately and contact the company for a full refund. Do not swallow. If you don’t love it, just contact us for a full refund. 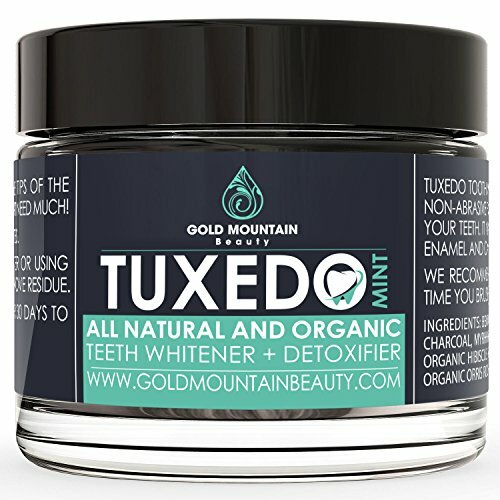 “TUXEDO” GENTLY WHITENS OVER TIME: Our natural teeth whitening formula is proven to gently remove stains from coffee, tea, wine, plaque, etc., to reveal whiter, brighter teeth. Use daily for 30 days to see results. This product does NOT bleach teeth with chemicals. A natural alternative to whitening strips and whitening peroxide. Natural teeth whitening for sensitive teeth. 32 gram jar. ALL NATURAL TOOTH AND GUM POWDER: Our safe natural formula is gentle on enamel, builds healthy gums and promotes healthy teeth and oral hygiene for a dentist cleaning feeling. 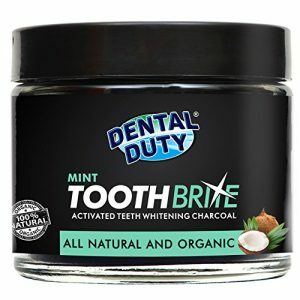 Use in place of regular whitening toothpaste, or use our coconut charcoal powder before your normal brushing routine. Helps whiten yellowed and discolored teeth. 32 gram jar last 2-3 months! 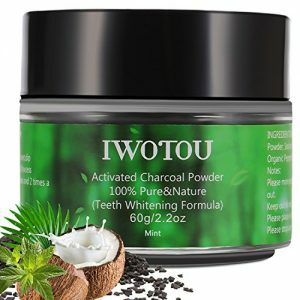 ACTIVATED COCONUT CHARCOAL: An anti-bacterial and anti-fungal powder that’s excellent for gum health and sensitive teeth, plus it removes food and drink stains over time! Use for 30 days for best results. Coconuts from Sri Lanka, made in a food grade GMP facility in the USA.